The collapse of "actually existing socialism", which confirmed the failure of the socialist movement to achieve a synthesis of the demands for autonomy and equality, the parallel degradation of socialdemocracy into an integral part of the neoliberal consensus, and the consequent universalisation of the market economy, have intensified the crisis which began about two centuries ago, when the system of the market economy and representative democracy were established. Thie establishment of the market economy in particular was instrumental in creating the present huge concentration of power, currently accelerated by globalisation. But, it is the concentration of power which is the fundamental cause of the present multi-dimensional crisis: political, economic, social and ecological. On the threshold of a new millennium, the need to formulate a new liberatory project is imperative. Such a project should aim at the negation of concentration of power, and at the same time would be the synthesis, but also the transcendence, of the two great historical traditions, the socialist and the democratic ones, as well as of the radical trends within the green, feminist and autonomist movements. Today, this project can have no other content than that of an inclusive democracy and its explicit aim should be the equal distribution of power among citizens: at the political level, through direct democracy, at the economic level through economic democracy, i.e. a new form of economic organisation beyond the failed systems of the market economy and central planning, as well at the broader social level. 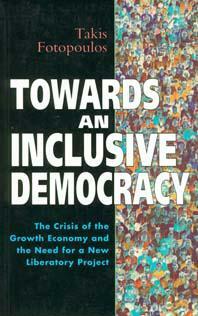 Inclusive Democracy therefore is not a utopia but, in effect, perhaps the only realistic way out of the chronic and today generalised crisis in an effort to integrate society with polity, the economy and Nature. “Fotopoulos' book offers the kind of radical insights to be truly visionary, to be utopian in the best sense of the term which means to identify existing potentialities for systemic change. Toward an Inclusive Democracy is a richly researched, clearly written, well-argued, historically-grounded thesis that humankind must find a way beyond the Charybdis of an internationalized capitalism and the Scylla of socialist statism”.